Meryton Mystery series on sale! Today I am the bearer of good news! Jennifer Joy will once more present her readers with an incredible promotion on the Meryton Mystery series. As you know this series has 3 titles: The Honorable Mr. Darcy, The Indomitable Miss Elizabeth and The Inseparable Mr. and Mrs. Darcy and the first two volumes will be on promotion from today until next Sunday! 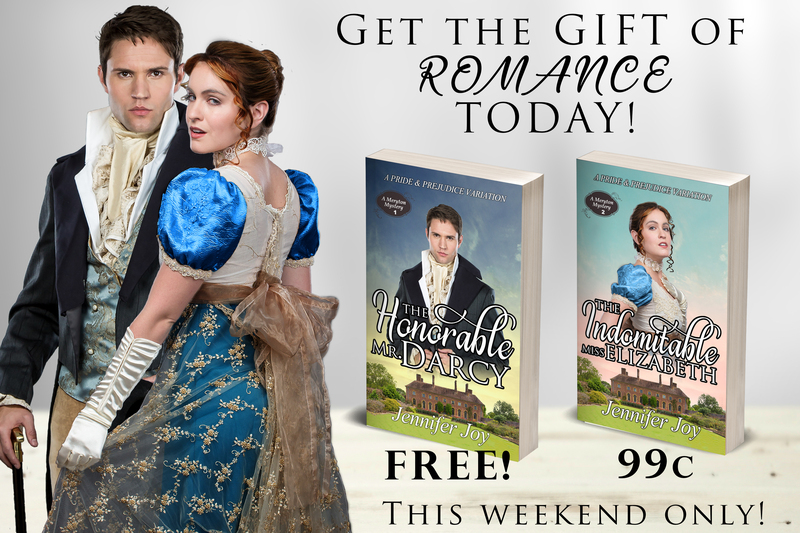 The Honorable Mr. Darcy will be FREE and The Indomitable Miss Elizabeth will be 99c!!! And of course, once you read the first two books you’ll want to read the third and final book of the series, so you can find The Inseparable Mr. and Mrs. Darcy on the same places at regular price (4,99$): Amazon.com, Amazon.co.uk, Amazon.ca. Jane Austen and mysteries … Why did you decide to mix the two? It all comes back to what I love to read. I rarely read books twice, but I’ve made exceptions where my two favorite authors — Jane Austen and Agatha Christie — are concerned! Theirs are the stories I return to time and again. So, I thought, why not blend the genres and show Darcy and Lizzy falling in love while they solve a mystery? A mystery? Last I counted, there are three in this series. What happened?! Haha! Meryton seemed like such a peaceful place before the murders began. Far be it from me to rush ODC to the altar when their courtship is fraught with so much danger and intrigue! The Honorable Mr. Darcy was planned as a standalone novel, but by the time I got to the end, it was clear that Darcy and Lizzy had a lot more story to tell … and Meryton had many more secrets to reveal yet. Do you plan any more books in this series? I have the next two books planned out, just waiting for their turn to be written. But first, I have a murderer to catch at Rosings… I won’t give anything else away because this standalone mystery/romance should be available to read next month.